Warbling Vireo has grey olive upperparts, and white underparts, with pale yellow flanks. Wings and tail are grey. Head is grey olive to grey, with a few contrasts with back. It has white thick eye brow above dark eyes, and dark eye line. Chin and throat are white. Bill is dark grey and pointed. Legs and feet are blue-grey. In spring plumage, Warbling Vireo is paler above, and flanks are whitish. Immature is duller and more brownish than adults. Warbling Vireo utters melodious long warbling phrases, a jumbled series of fairly rapid whistled notes. Song includes rising and descending notes, ending in high pitched sound. Call is a nasal “eeah”. 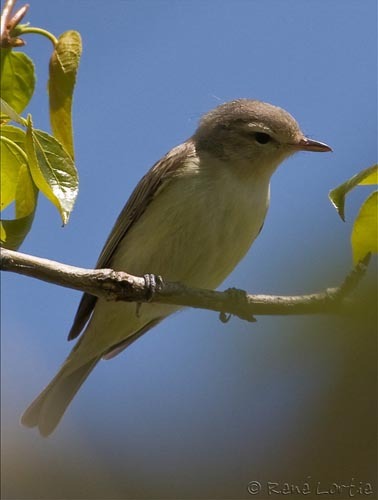 Warbling Vireo lives in several kinds of habitats with deciduous trees, woodlands, riparian areas and pastures with scattered trees. Warbling Vireo is found from Canada through United States. It winters in southern Mexico and northern Central America. Warbling Vireo searches for food moving sideways along twigs, to snap insects. It forages in top of trees. It gleans from leaves, flowers and branches. It hops and hovers along branches. Warbling Vireo is monogamous and solitary nester. It migrates southwards to winter. Courtship displays include courtship song from male. It struts around female with fanned-wings and tail. Female quivers wings in response to the male. They defend strongly the nest site, and may attack furiously lizards ascending their tree. Warbling Vireo performs gentle gildings, and it often flies relatively short distances, with weak fluttering flights of short duration. Warbling Vireo may build its nest as at about 30 to 60 feet above the ground in a tree, or lower in bushes and small trees. Both adults build the nest. It is a cup, suspended from a twig at the end of a branch. It is made with slender blades of grass and some other vegetal material and fibres. It is lined with grasses, feathers and horse hair. Female lays 3 to 5 white eggs, finely spotted with dark, in April to July. Incubation lasts about 12 to 14 days, shared by both parents. Chicks are fed by mother. Male brings insects to female, and she gives them to chicks, after chopping and macerating them with her beak. Young leave the nest about 12 to 14 days after hatching. Warbling Vireo feeds mainly on invertebrates. It may also eat some small fruits, such as berries before migration. Warbling Vireo is abundant and widespread, although is declining in some parts of their breeding range, with intensive use of pesticides and habitat loss.